Excavation photograph - passage and chamber from the south-east. 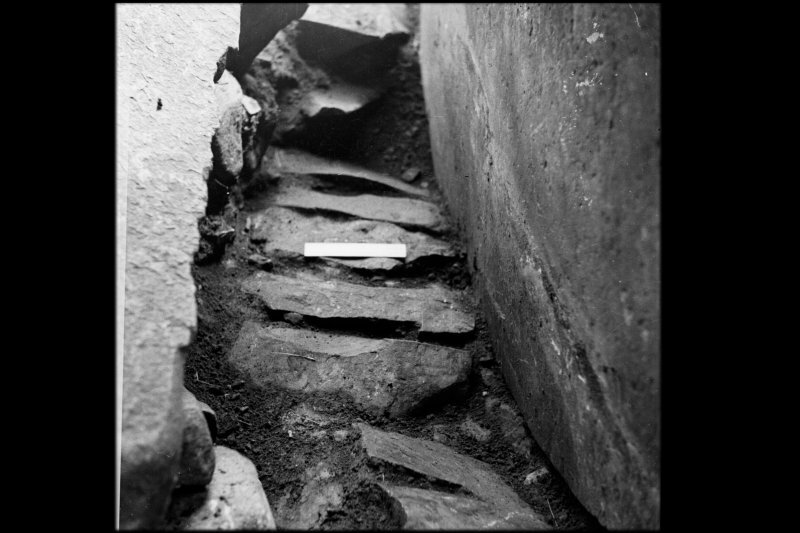 Excavation photographs - paving in chamber and passage, from the north-west. (NX 3524 7836) White Cairn (NR). A heavily robbed chambered round cairn of the Bargrennan group excavated by Piggott and Powell in 1949 and now preserved within a Forestry Commission plantation. The excavations have been left open and the cairn, composed of large rounded boulders, is now partially overgrown with grass and bracken but it remains 4ft 6ins high near the centre and 2ft to 3ft high elsewhere with a diameter of about 45ft. There is no evidence of a kerb. There is no structural distinction between the passage and the chamber which has been entered from the SSE. Various scratches, some forming rectilinear designs which may be ancient were noted on the SW wall of the chamber. Finds from the excavation, including sherds and a flint fabricator, are the National Museum of Antiquities of Scotland (NMAS) (Acc Nos EO 843-7). This chambered cairn measures 17.6m NE-SW by 15.3m and 1.4m high. It is otherwise as described. The scratch markings on the chamber wall have been obscured by graffitti. Two sherds and six fragments of probable neolithic pottery, found by Jane Murray at the White Cairn, were donated to the NMS; registration numbers EO 1141-4. NX 352 783 As part of the Archaeosights Project an interpretive panel was installed in the foreground of the entrance of White Cairn, Glentrool (NMRS NX37NE 1). The construction of a stone plinth on which the interpretive panel was to be fixed necessitated the excavation of an area 1m2. The excavation in April 1999 revealed the top face of a large element of blue whinstone, c 50 x 60cm, within the topsoil immediately beneath the turf. It is unclear whether this was the top face of a natural outcrop or a deliberately deposited slab. Four chip marks were evident on the top face of this large stone, defining a rough 30cm square. Also embedded in the topsoil were several smaller fragments of blue whinstone. While the parallel edges of the two largest stones appeared to align with the entrance of White Cairn, the shallow depth and limited area excavated inhibits any confident interpretation. No artefacts were recovered. Report lodged with the NMRS. Sponsors: Dumfries and Galloway Council, Dumfries and Galloway European Partnership, Landfill Tax. NX 352 783 A trench was opened in August and September 2004 to the S of the cairn (NX37NE 1) which included the southern portion of the cairn and the passage. The passage had been examined by Piggott and Powell in 1949 (PSAS 83), who uncovered a series of paving slabs. These slabs were removed but no substantial pre-cairn activity was found. However, under the cairn, where examined, and around the edge of the cairn a lithic assemblage was found which contained some diagnostically Late Mesolithic pieces. 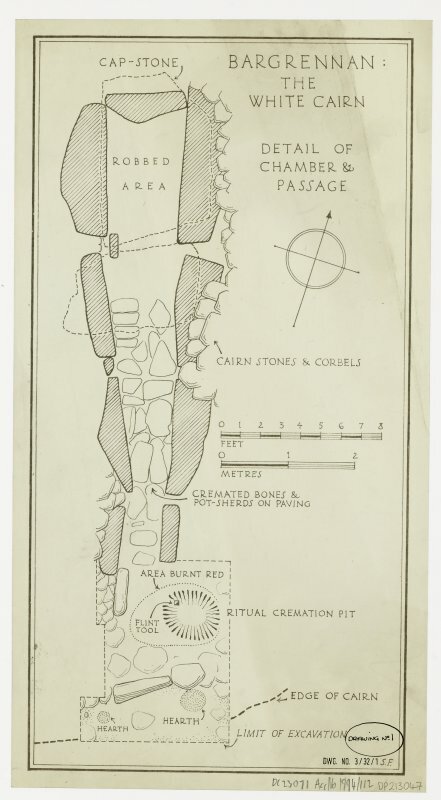 To the W of the passage a cist was uncovered which contained a large Cordoned Urn and cremated bone. To the E of the cairn, at its lowest layer, another ceramic vessel was uncovered, but this remains in situ to be removed next year. Pot fragments were also found in an amorphous feature in the area outside the passage. Finally, the large cremation pit excavated by Piggott and Powell in 1949 was re-examined, recovering some cremated bone and charcoal left in situ. Sponsors: British Academy, Society of Antiquaries of London, Prehistoric Society. NX 352 7 83 Two trenches were opened in August and September 2005: one to the S of the cairn (NX37NE 1), encapsulating the passage and entrance, within the area of one opened in 2004 (DES 2004, 37). The second trench was T-shaped and at the rear of the monument, cutting through the cairn and its perimeter, exposing the area directly without the cairn. No significant remains were recovered from the rear trench, but one upright and one fallen kerbstone were located. In the southern, front trench, the urn located last year was recovered from a small pit. A series of kerbstones were also discovered around the original perimeter of the monument, which had all fallen forwards away from, and had become covered by, the collapsed cairn. Now surrounded by forestry plantations, this much reduced circular cairn has given its name to a group of about a dozen passage-graves of localised distribution in this area. The cairn has a diameter of 13.7m, and in the centre stands to a maximum height of 1.4m. 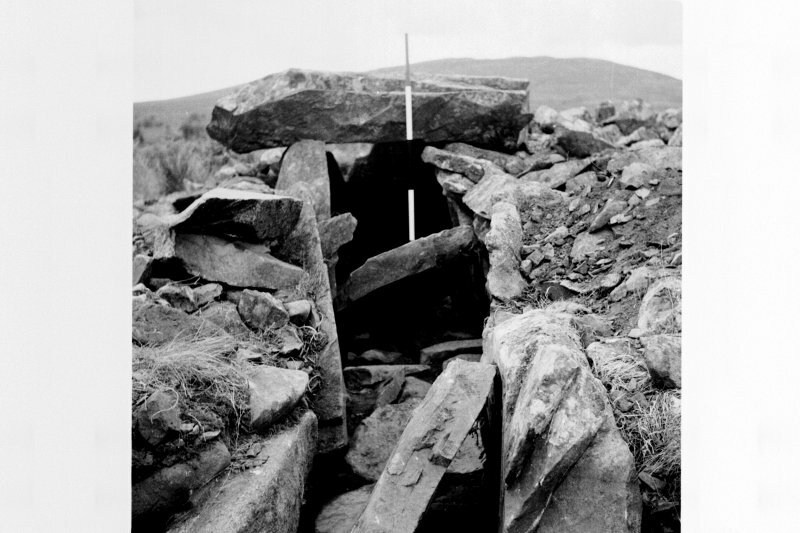 Excavation in 1949 showed that the centre of the cairn contained a megalithic chamber and south-facing passage which were structurally undifferentiated. In a ritual fire-pit near the entrance cremated bones were mixed with abundant fragments of oak charcoal, whilst frnds (from the passage) comprised up to 60 small sherds of an unusual variety of late neolithic pottery. NX 352 783 A laser scan of the White Cairn, Bargrennan was carried out on 30 March 2016. The chambered cairn is located in commercial forestry 400m W of Glentrool. The cairn was excavated by Piggott and Powell in 1949, and is well known as an example of the round passage graves of SW Scotland that came to be known as the 'Bargrennan type', standing in contrast to the more widespread 'Clyde' long cairns. The survey was undertaken for conservation management purposes.